This probably doesn't seem like a big deal to AFB readers Stateside, but actually being able to find and buy action figures at retail has become such a novelty here I had to post about it. After a tip-off from AFB Forum member NiteOwl, I made a detour from my normal Sunday shopping to check out my local Kmart, which is in a mall I've been avoiding as it's a construction nightmare at the moment. It's also been so long since my once common toy-run through all the possible shops netted anything, I've really fallen out of the habit. Happily, my trip was not in vain - just as NiteOwl had found in his local Kmart, mine had the latest (or one of the latest) wave of Justice League Unlimited singles: OMAC, Ultraman and a show-accurate Red Tornado, which I bought, and Captain Atom and Red / Blue Superman, which I left on the pegs for another happy hunter. JLU is a line I have tried to quit at least half a dozen times, primarily because of the lack of a local release here for some time. Things like the Mattycollector exclusive packs and characters like General Eiling and Amanda Waller have kept me hooked, however, and I'm looking forward to the Mattycollector JLU Parademons coming up shortly, so I was keen to have new characters to line (for me) OMAC and Ultraman, and a Red Tornado that looks more like the unique look he has on the show. Plus, I really can't underplay the chance to actually buy a toy a retail as a factor in deciding to buy! 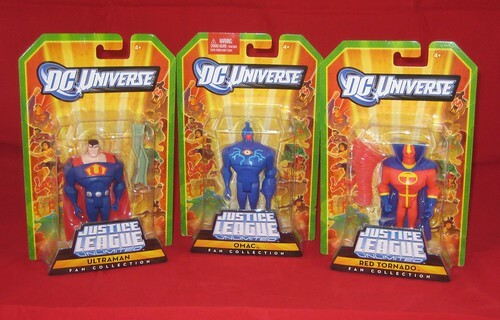 There's nothing groundbreaking about any of these figures - the standard JLU buck is used in all three, but OMAC has some extra sculpting for his fin-head, and he also has an arm attachment that connects to his left arm in much the same way the the Metal Men extension pieces snap on in DCUC, although not quite as snug. Ultraman has a disc-y sort of belt sculpted on, and similar discs on his forearms, which are a bit lost as they're placed at the back. Ultraman also comes with the standard strong-person bent piece of steel, which he can't possibly grasp, so that's a bit of a fail. Paint is great on all three, but I was glad a had a choice for Red Tornado as the one I got was the only one that didn't have a paint blip on his chest emblem. Taking these out of the package, I was reminded of the other reason I've been tempted to quit this line, and the reason I don't currently have JLU on display: these little guys are such a bugger to stand up! The Mattel JLU bases are also way too big to display a wide number of them. That's not news though, and I guess most collectors have found their ways around it by this point! Again, not necessarily post-worthy on their own, but these make news for me simply because they actually hit the shelves here - so here's hoping it's the start of a trend! You can discuss this at the AFB Forum and comment on this post to enter the October AFB Comment of the Month Contest - with an extra prize for an AFB Facebook fan this month! I'm am forever impressed by the random lines Australian stores seem keen to push! man if you don't have a 5" plus line for a kids cartoon show, just forget it. Congrats on the find. Glad to see you're able to find new stuff out there. 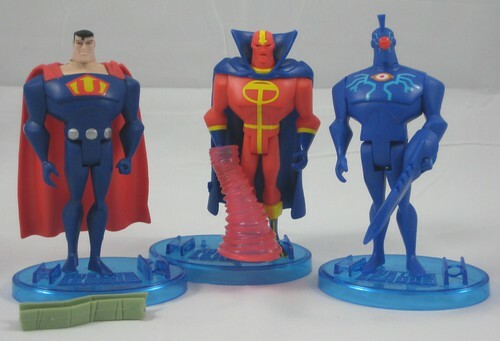 I want the red tornado bit from Red Tornado. JLU had such a fantastic selection of characters. i REALLY like that Red Tornado! At least you are finding the things you like! It is not much easier to find things widely in the UK. Just because someone seems something in Manchester does not mean it will ever show up in Coventry or Reading.